In this wacky Cheapass title, players are Sous Chefs trying to get to the top floor of a skyscraper by scaling the outside. However the maniacal Devil Bunny is hopping about in a mad lust for blood thinking he'll get a ham by knocking you off. Yeah, right, whatever. Players seek to move their two markers along a wide-ish track. The trick is that your pieces can only move diagonally, and your movement points are somewhat dictated by dice. 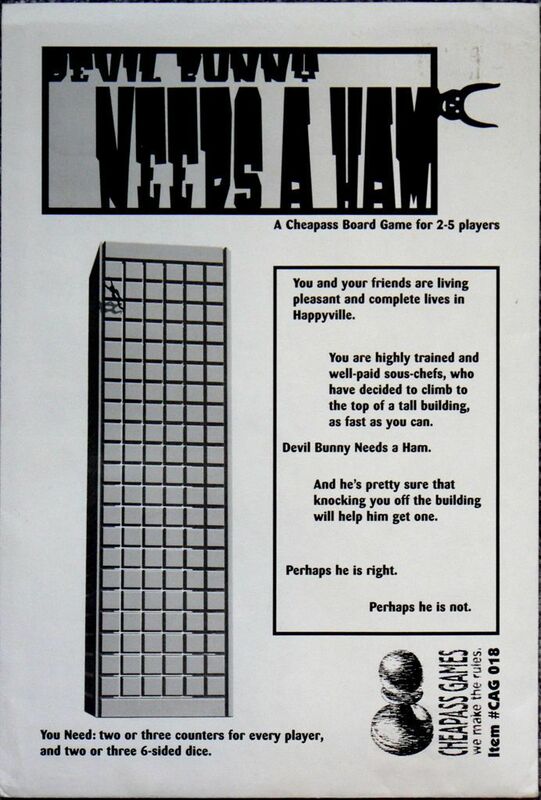 Plus, when you roll a certain number, the Devil Bunny lands on the leading player, which knocks him off the building and perhaps into the person below him. Oh my.